Once again the police of Alexandria Virginia are singling out bicyclists by means of excessive enforcement of traffic laws on the streets of Old Town, Alexandria. The primary points of enforcement are along Union and Royal Streets which coincide with the Mount Vernon Trail. The usual reason for the enforcement (sometimes euphemistically referred to as educational efforts) is not an increase in bicycle-pedestrian crashes, but rather the cranky complaints of a handful of residents. Admittedly sometimes these complaints are justified. An example is when Walter Mittys in lycra go zooming through the streets with no regard for any other road user. These people are obnoxious and deserve whatever tickets they get. Generally speaking, however, most of the people that get ticketed are the bike commuters who probably average about 10 miles per hour during their time in Old Town. In the morning these bike commuters (like me) are riding on a virtually empty street. Personally I’d rather be focused on delivery and garbage trucks than some overzealous police officer trying to teach me a lesson. While driving 57 in a 55 is technically in violation of the law, it’s almost certainly safe and is probably more safe than driving 54 (as is rolling through a stop sign at slow speed. See my first example below.) I can only imagine the traffic court judge who has to deal with scores of red Camry drivers who show up to contest tickets for going 2 miles per hour above the speed limit. He’d throw them out and reprimand the ticketing officers. The fact is that cars on Union Street are far more of a public safety threat than bicycles. Here are three recent incidents from my evening commute. One evening last week, I was being paranoid and came to a complete stop at all the stop signs. It was dark. I even put my foot to the ground. (This makes me a sitting duck to any vehicle coming up from my rear.) A Honda CRV came up behind me swerved into the left hand lane and blew through the stop sign without breaking. The car was going what looked to me like 15 to 20 miles per hour. From personal experience, I can tell you that if that car hit a pedestrian at that speed they’d be out of work for at least 3 months. Because that is what happened to my wife three years ago. The driver continued south on Union, blowing through a second stop sign before pulling over near the beach volleyball court in a park at the south end of Union. As I rode past, I noticed the driver was fiddling with her cell phone. Last night I was riding south on Union when I came to a stop at the intersection at King Street. It was dark. A pedestrian wearing a reflective belt across her chest was about to walk across the street in the crosswalk. She had to stop because a car came through the intersection heading north on Union with only its parking lights on. The driver never saw the pedestrian. The pedestrian looked at me and shook her head in disbelief. Two blocks later I was blinded by a northbound car with its high beams on. This blast of light backlit three pedestrians dressed in dark clothing walking across the street in mid block. Had I been going anywhere near the absurdly high 25 mile per hour speed limit I’d have hit them for sure. After I passed them, still in the glare of the high beams I spotted two more mid street pedestrians who were obscured by the intense back light. If you think I may have contributed to this consider the following set up. I have two rear facing red lights one of which is attached to my helmet with a reflective yellow band. I have four rear facing reflectors. I was wearing a reflective vest. My sidewalls are made of reflective white material. My shoes and pedals have reflectors on them. I have one forward facing reflector and a 500 lumen light on my helmet. If you can’t see me, you obviously don’t belong behind the wheel of a motor vehicle. My short term remedy to avoid this harassment is to use other cross streets in Old Town. Some bike commuters have suggested just riding down Washington Street, the very heavily traveled commuter route to and from DC. I honestly think we should give this serious consideration. The traffic back ups from this would be epic. My medium term remedy is to do a study of crashes involving pedestrians and vehicles in Old Town. How many are there? When do they occur? What injuries occur? How many days of work are lost? (Wanna bet who would come out on the short end of this study?) Then use the data to enforce the traffic laws rationally. My longer-term remedy for traffic safety in Old Town: reduce the speed limit to 10 miles per hour. Sorry drivers you’ll have to use that pedal in the middle of the floor. Replace every other stop sign with a yield sign. Enforce the traffic laws without harassment, including ticketing drivers. Problem solved. And while we are at it, give parking tickets to the homeowners on North Union street who park perpendicular to the street blocking the sidewalk and the bike lane. I routinely see the parking enforcement patrol ignore these violations. 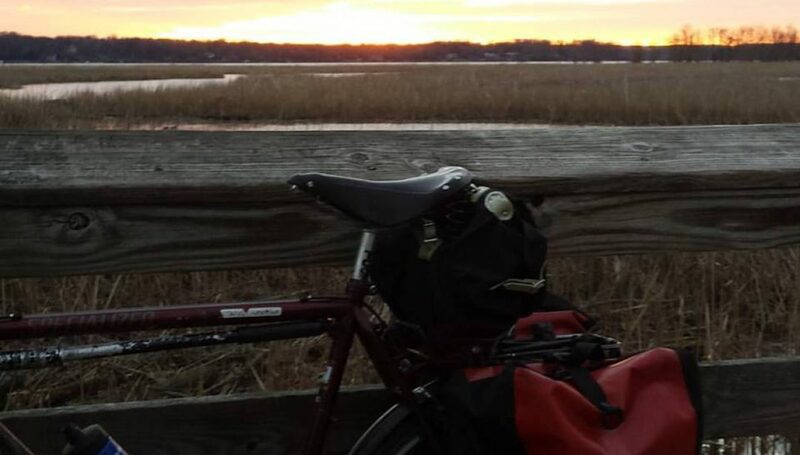 Posted on November 10, 2015 November 10, 2015 by rootchopperPosted in "Mount Vernon Trail", #bikedc, #bikeva, Old Town Alexandria, police harassmentTagged "Mount Vernon Trail", #bikedc, #bikeva, Old Town Alexandria, police harassment.